Meet P. Mattern! A Rukia Publishing Featured Author!!! 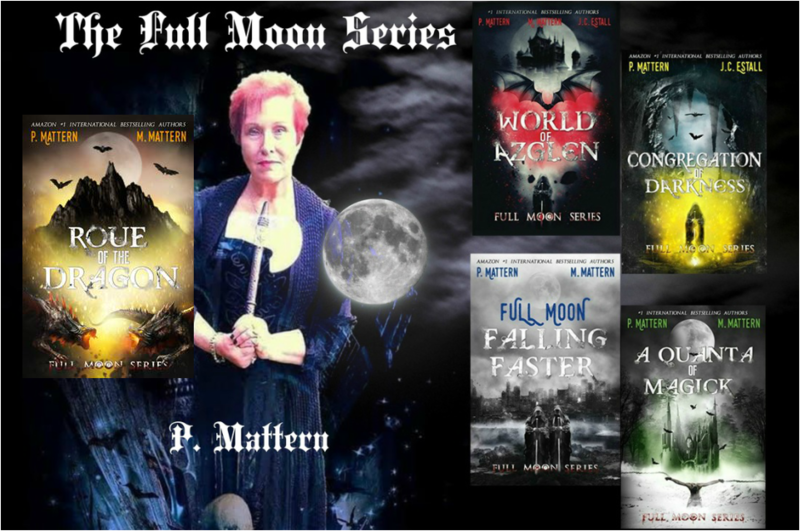 ​P.Mattern is the Award winning(Scariest Story 2015 from Tell-Tale Publishing and Top Horror Book and Author, Urban Fantasy and YA Fantasy Author Blog Awards ), Amazon #1 and Top 100 Bestselling author of three series (Full Moon Series, Vampire Princess and Forest of Bleeding Trees ) and numerous standalone titles including Shock of Night and Strident House published by Booktrope Publishers Forsaken Imprint. She began composing stories while still in utero and was born with a stylus clutched in her tiny hand. Go To P. Mattern's Book Showcase to learn about this best selling authors books! Good Morning! Thank you so much for taking the time to talk with us about yourself and your books! We know it can be difficult to talk about yourself but we hope you feel at ease here at Rukia Publishing! We are huge fans and can't wait to find out more about you! Hi ! I am Amazon#1 and Top 100 Bestselling Author P.Mattern! I write solo and also write with my adult kids J.C.Estall and M.Mattern. I was reading Anne Rice and I looked at my adult handicapped son and wondered if he was bitten by a vampire if he would become normal or even supernormal, with special abilities. The Full Moon Series was born. Strident House was inspired by a very haunted facility where I worked for 7 years. Forest of Bleeding Trees goes back to my roots growing up in Virginia and having cousins in West Virginia, which is a very mysterious and spooky place. I google a lot and read informational books, especially to get the details of a setting for a story in place or time. For Strident House I joined a paranormal Investigative group INOPS and went on investigations! EEEEEEEK! And all it cost was your soul. The question is:Would you do it? They would probably say generosity. I would argue for my inappropriate sense of humor. Yes. Readers are the coursing lifeblood of our books I take them to heart. I blog on my Patircia Annette Facebook Page. I read voraciously, watch episodes of A Haunting on cable, eat too much, sing offkey in my car like i'm a rock star, exercise at the gym because I eat too much and garden. I also paint. COME JOIN OUR VAMPIRE TRIBE OF READERS! This was a tremendous amount of fun! We really enjoyed our time with you and appreciate your candidness, and we thank you for your "inappropriate sense of humor". It is well accepted!! !